A nerdy girl who loves all things nail polish related. Today has been a lazy day for me. I almost didn't do my nails yet again, but decided that I wanted to do them kind of at the last minute. Once I sit in my chair at my "nail desk", I just get compelled to want to do my nails lol. Today's prompt was a little hard for me. I couldn't think of anything to do. I tried around four designs before picking the one currently on my nails. There's a lot you can do with black and white, but it wasn't coming to me today. 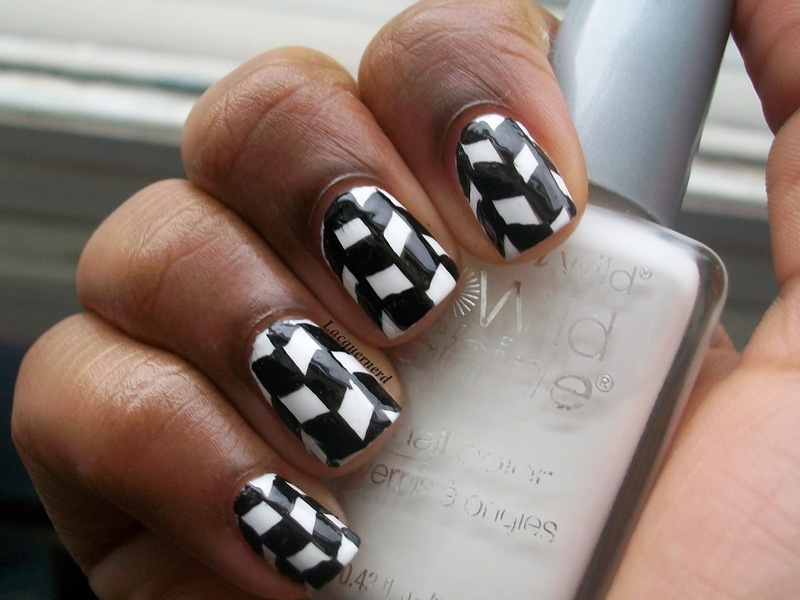 For the black and white nails, I did a freehand chevron design. 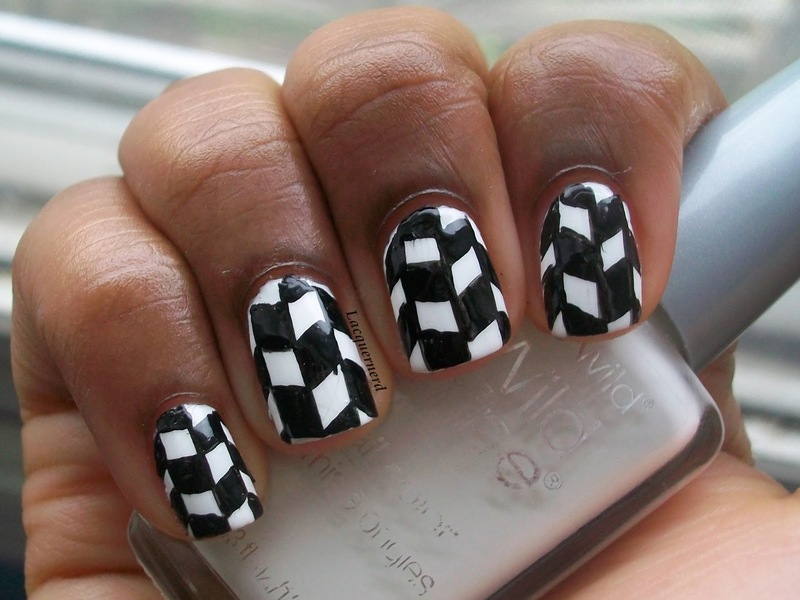 I've never done this design before but I've seen a lot of people do it on their nails. I thought it was going to be really hard, but as always it turns out to be really simple. I have a tendency to think that everything is hard when it comes to nail art, and then I try it and it works out. Anyone else get like that? For this design, I first made three lines on my nails with a striper brush (which doubles as my detail brush). 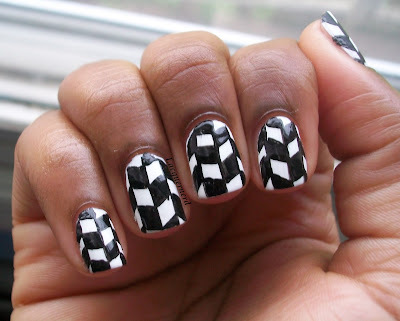 Depending on the size of your nail, you want to do 2-4 stripes on each nail. Then, create the lines inside the lines and outside of them. You want to make the lines at an angle on the inside going down. For outside the lines, draw lines at an upward angle. Next, fill in every other space with black polish. Finally, finish off with a top coat! This design is growing on me. At first, I didn't like it for some reason but I'm getting there with them. I think they would look better if it was a different color combination though. What do you think of this design? Tomorrow is metallic nails! It reminds me of a waving checkered flag from race tracks. People have been saying that actually. It does though. I love hearing from you all! Please refrain from posting links in the comments. If you want me to check out your blog, shoot me an email instead! I'll be glad to check it out. Hello everyone! My name is Tyeisha and I love all things nail polish related and I'm a huge nerd, hence the name Lacquernerd. Hope you all enjoy the blog!
. Watermark theme. Theme images by blue_baron. Powered by Blogger.